Mount LeConte is a much reach destination for any serious hiker spending time in the Great Smoky Mountains national park and with a one way trip up to its peaks taking between 5 to 8 miles, all uphill, and with its breathtaking sunrises and sunsets, most agree the best way to enjoy Mount LeConte is to be able spend the night. Mount LeConte lodge has been in existence in one form or another since 1925 when it started as a tent camp before the Great Smoky Mountains national park existed. A year later construction began on what was to be the only remaining permanent indoor structures within the GSMNP for visitors to stay overnight. Today as many as 60 people a night can stay in the Mount LeConte Lodge which is a collection of 7 extremely primitive cabins and 3 primitive lodges. Hard to believe that these extremely sparse cabins and lodges with no electricity or running water are actually the hottest ticket in town with guests having to reserve a cabin up to a year in advance! Mount LeConte Lodge is Closed for 2019 Season from November 25th to March 23rd. 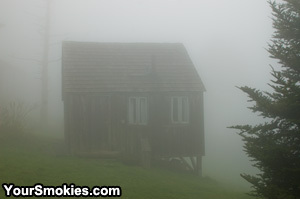 A Mount LeConte rental cabin in dense fog. 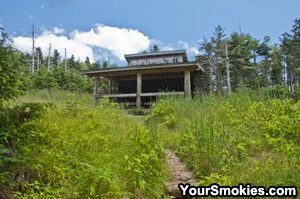 Booking for next year's stay in the Mount LeConte Lodge starts on October 1st at 8:00 am EDT. You can send written requests earlier starting in August by filling out a reservation form, by fax to (865) 774-0045, by sending a request by mail to LeConte Lodge, 250 Apple Valley Road, Sevierville, TN 37862 or email (reservations@lecontelodge.com). Only 1 request can be made per party and the lottery to get a reservation is random is does not take into account when the request is received. If you are lucky enough to get a reservation you are notified by US mail. If you do not get a reservation confirmation by October 9, you can call (865)429-5704 from Monday - Friday, 8:00 am - 5:00 pm EST to try to get an alternate date. The LeConte Lodge reservation office is lightly staffed so it may take as long as 5-7 days to even get a response that an email has been received. If all else fails, starting in early December you can get on a waiting list to stay on LeConte if there are any cancellations. You do not get automatically placed on the list if you do not get the dates you want during the lottery. In some cases people wait for years in order to stay in the LeConte Lodge and most everyone who stays on LeConte consider it an amazing experience they want to do again and again. *Tennessee sales tax is 9.75% Mount LeConte Lodge accepts Visa, MasterCard and Discover for all purchases. For adults 21 and older you can have wine with dinner at $10 per person per night. Advance orders requested. No tent camping is allowed on Mount LeConte nor will you find camping allowed on any hiking trail leading directly up to Mount LeConte. 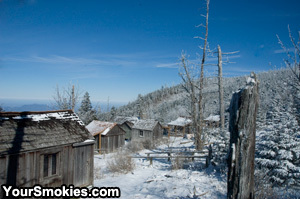 There is however a very popular shelter on Mount LeConte that accomodates up to 12 Campers. Mount LeConte Primitive Shelter in summer. The shelter does not allow tent camping or horses. Regardless of weather conditions you can not cook inside the shelter and all food and trash must be stored by being hung on bear cables. Besides these being park regulations, bears are often an issue at the Mount LeConte Shelter so for their and your own safety please observe these rules at all times. The Mount LeConte Shelter does not have running water but it does have an outdoor latrine with privacy - a rare comfort in the Great Smoky Mountains national park. You can get safe drinking water a short walk away at the LeConte Lodge.